The most novel and interesting part of the homestretch equipment was the row of supply pits that stretched in front of the grandstand for its entire length. There was space enough between the pits and the track for racing cars to stop for their supplies. Mountains of tires were dumped into the pits in the aggregrate, to say nothing of the rivers of gasoline and oil. It was very highly interesting to watch the crews take on supplies and make their adjustments. Each car had its designated section of the supply pit. 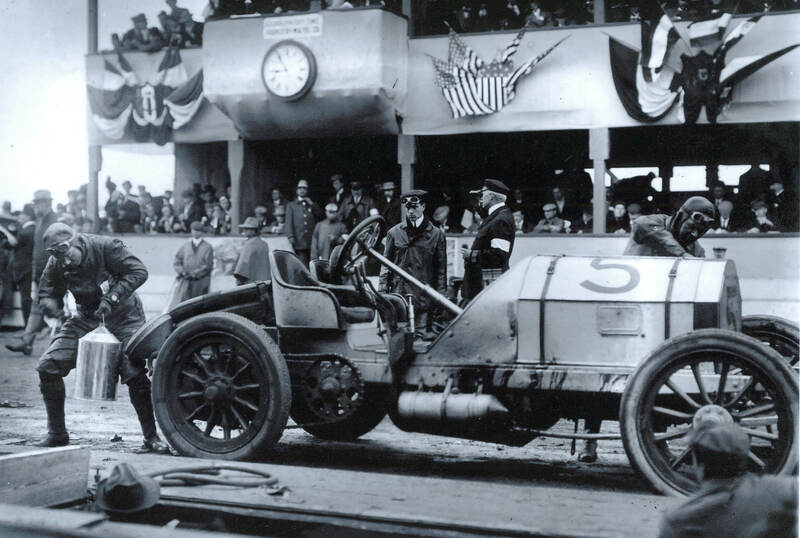 As seen here, the M34 Lancia driven by William Hilliard made a "pit" stop during the 1908 Meadow Brook Sweepstakes. For the 1908 and 1909 races, only the driver and mechanician were allowed to work on the car. The pit crew could only pass along the supplies. 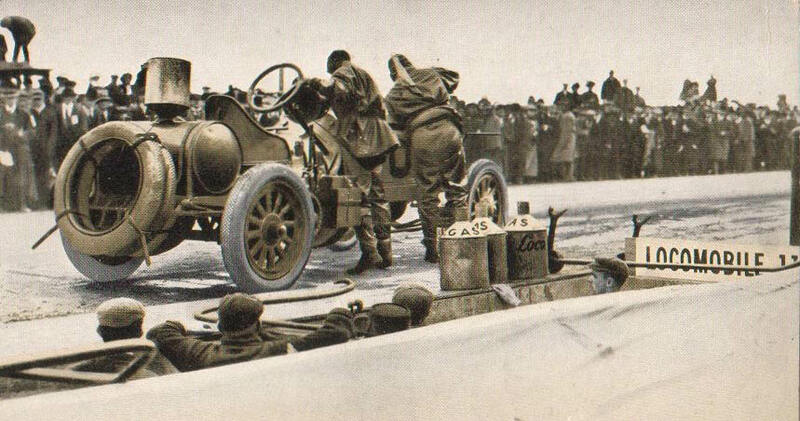 Here, driver William Luttgen refueled the #5 Mercedes as referee William K. Vanderbilt Jr. watched during the 1908 Vanderbilt Cup Race. Another view of Luttgen and his mechanician Pfeiffer refueling at the service pits. George Robertson and Glenn Ethridge refueling "Old 16" at the Locomobile pit. 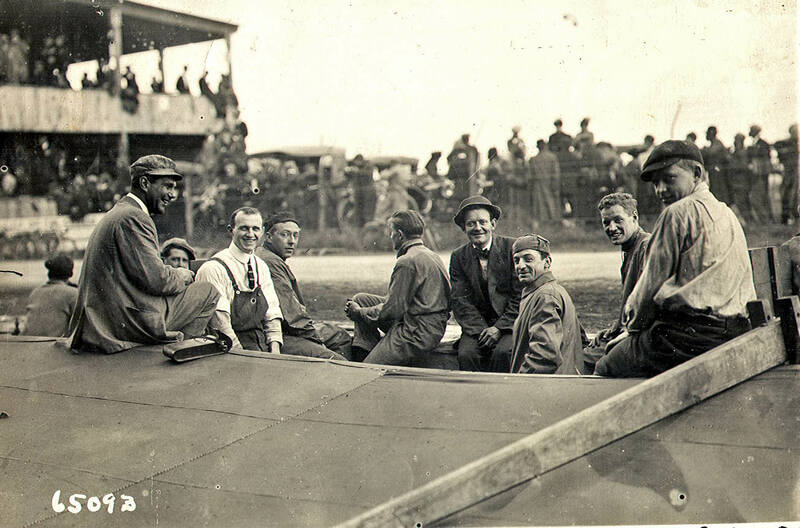 For the 1910 Vanderbilt Cup Race, the pit rules were revised allowing two of the pit crew to assist and driver and mechanician. However, this assistance was limited to the replenishment of water, oil, and fuel and the replacement of tires. These crew members could also crank start the car. 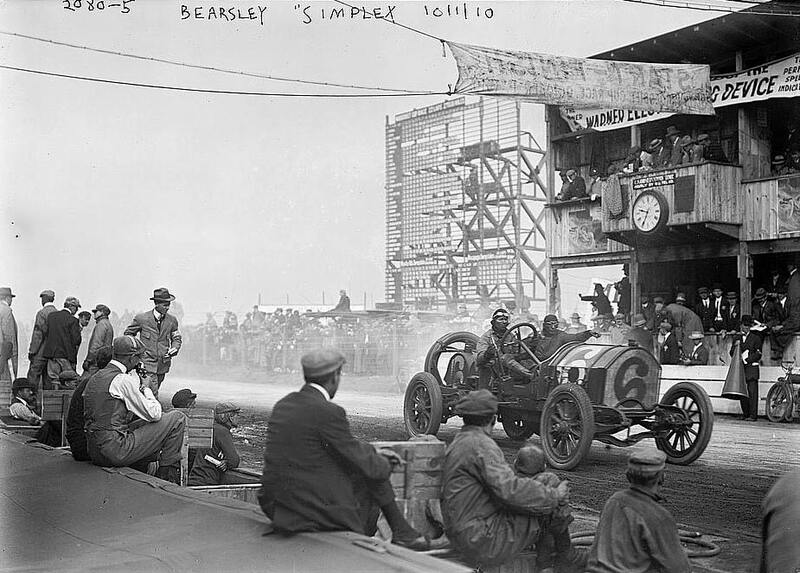 Robert, here is the view that the #6 Simplex crew had during the 1910 Vanderbilt Cup Race. 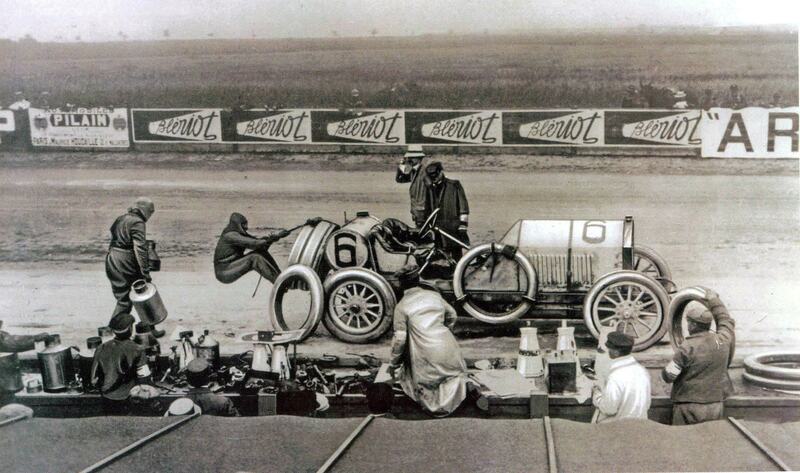 Does anyone know when the first below-ground service "pits" were used for auto races in Europe and the United States? March 27, 2018 Our race expert Ariejan Bos states that the the first use of pits was at the French Grand Prix in July 1908. This photo was from the French Grand Prix de l'ACF held in Dieppe on July 7, 1908. 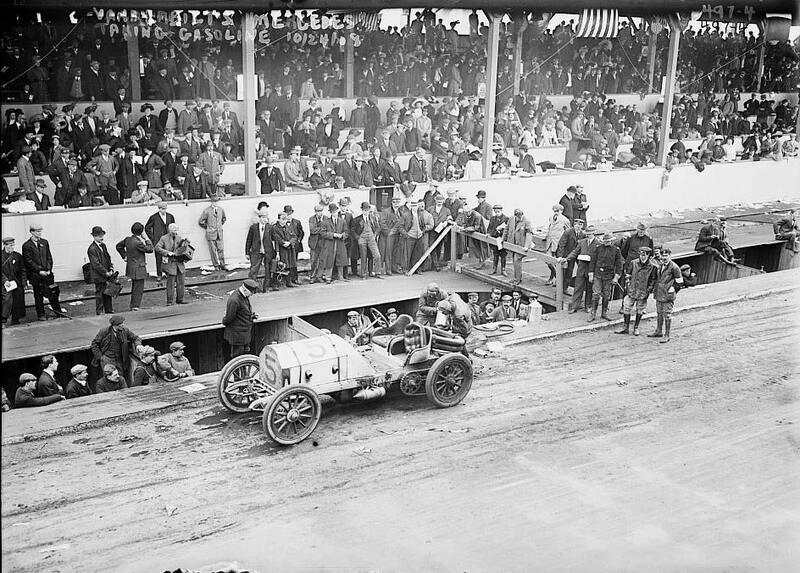 The 1908 Vanderbilt Cup Race was likely the first use of pits in the United States. I can’t imagine how terrifying it was for the ride along mechanic travelling in a 1,200kg metal behemoth at break neck speeds on tires that could at any given moment decide they no longer could be bothered with such abuse, all the while trying to find anything within eyesight to hold onto. Such was life for these unheralded men. At one particular Grand Prix race, Christian Lautenschlager changed ten sets of tires because of excessive wear. Now,i wonder whether his mechanic had anything to do with the decision. I would rather be in the pits, if only for a short time. Howard, Scott-Moncrieff mentions that the French Grand Prix at Dieppe in July1908 had dug out pits for servicing cars in front of the grand stands. This is a very interesting post. I never knew that underground service pits pits were used during the early years of auto racing. I did know where the term “Pits” came from, My Dad and Grand Father owned and operated the “Hester Garage”, the Durant agency, in San Jose, CA during the 1930s. I remember the service pits at the garage. As I recall there were three of them in a car port type section of the U shaped garage structure. I was always frantically instructed not to fall in the “Pits” anytime it looked like the “Pits” had attracted my attention. groups of boards nailed together in the size of doors had to be used for the cars to pull into or out of the pits. 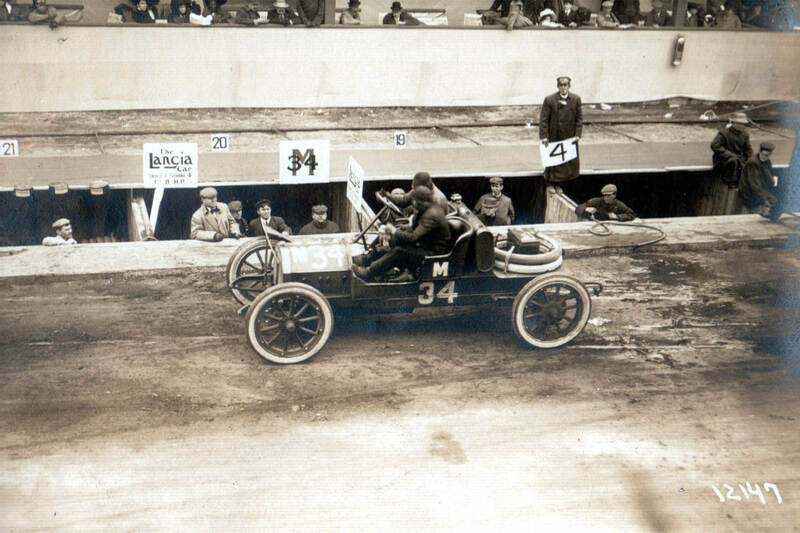 Photos from the 1908 event also show pits, but these were not designed to be straddled by the cars. They are similar to the Vanderbilt 1908 pits. The 1907 pictures you are referring to are of the Pesage (scrutineering) area, not the track, and were taken the day before the race. The inspection pit was so that the officials could check for extra hidden fuel tanks as the official fuel allocation was provided by the ACF. There was actually a separate “depot” area for the 1907 race, set back from the track on a “by-pass” and which is also illustrated in Mathieson’s book. The accepted first use of “pits” is the 1908 GP de l’ACF: I have to wonder when looking at pictures of them whether the dug-out design was simply to give the spectators a better view. After all, only the driver and riding mechanic were allowed to work on the car, with the people at trackside being there purely in an advisory capacity. The earliest recorded use of “Pits” in European racing was at the 1908 Targa Florio-18 May at the Circuito Grande Madonie. These are described as shallow emplacements dug into the ground so the mechanics could work on the detatchable rims. Unfortunately i don’t have any photos but i’ve always been curious as to the deepness of the area. However, photos do exist of the pits at the 1908 GP de l’ACF at Dieppe run on the 7th of July. The rules stipulated that only the driver and mechanic could work on the car during the stop. I can’t answer your question in regards to the first use of pits in American autoracing but i always assumed it was at the 1908 Vanderbilt Cup although the little bird on my shoulder is telling me it could’ve been earlier. Maybe the American’s invented the idea first? In 1908 the Targa Florio in Sicily saw the appearance of “pits,” shallow emplacements dug by the side of the track where mechanics could labor with the detachable rims on early GP car tires — themselves a major technical improvement over the earlier technique of permanently attached wheels and spokes. But even so, racing cars of the early years were too heavy and fast for their tires; Christian Lauteschalnger’s winning Mercedes shredded 10 tires in the 1908 French Grand Prix at Dieppe! According to an article in the “Motoring” section of Brooklyn Life (Oct 3rd, 1908 page 22): “The idea of a depressed supply station is to give the spectators in the grandstand a good view of the drivers and mechanics while they make their lightning tire changes…..The idea has never before been done in this country and the Vanderbilt Cup Commission…is sparing no expense to have the innovation introduced properly and to add still another attraction to these great contests.